Click the pic on the left to view a Brazilian TV report on Jon's free show in Sao Paulo, during which he performed the Concerto. As Jose Ricardo Diniz (who told me about this) says, "its cool, giving a chance to people who can't buy expensive tickets watch a great piece of music." with thanks to Roberto Souza, has also kindly pointed us to "a blog written by a Brazilian guy who works for MTV Brazil". "What an amazing night. The highlights were plentiful but none came close to the undoubted peak of the evening, which was the opportunity to see Jon Lord at the Hammond Organ playing an electrifying Child in Time whilst supported by the excellent Luke Morley (Thunder) and bandmates. The singer was Steve Balsamo who I suspect is new to most people, but there was something really remarkably appropriate about him performing a song which Ian Gillan made his own over the years. Steve first made his name playing the lead role in a 1997 revival of none other than Jesus Christ Superstar, following in the footsteps of none other than the first recorded "Jesus Christ Superstar", Ian Gillan. I saw Steve in the 1997 production, and his performance of the Gethsemane song was awesome, though nothing will ever quite match Ian Gillan's recording for me. So to see him take on the role of lead vocals on Child In Time was interesting to say the least and he did a thoroughly creditable job, though I must admit to spending the majority of the performance watching the maestro on the organ. "After contributions from The Pretty Things, Sons Of Albion and fine performances from Uriah Heep and Thunder (and a dreadful set by Hot Leg), Jon Lord took to the stage. 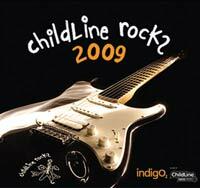 Accompanied by Steve Balsamo on vocals he perfromed a beautiful rendition of Pictured Within. It was spoilt slightly by chattering in small pockets of the audience, which seems to be common at gigs these days (no attention span!!!). Child In Time followed, with backing by Thunder, an incredible performance by all on stage, even more incredible when you think that they probably had minimal rehearsal time. Jon's Hammond was high in the mix and it was quite moving to be able to see him perform again. Glenn Hughes was next on stage, and as he did at the same event the year before, he wiped the floor with every other vocalist there... Bernie Shaw (Uriah Heep), Danny Bowes (Thunder), Steve Balsamo and Justin Hawkins are all fine singers and were more than impressive on the night, but as soon as Glenn opened his mouth you knew he was in a completely different league to anyone else. He performed You Keep On Moving with Thunder / Jon Lord, and it was a complete joy to see them performing together (I'm too young to have witnessed them in Deep Purple). Jon then left the stage, and Glenn sang Mistreated, stating that David Coverdale didn't perform it any more and had given Glenn his blessing to do so. If you've seen Glenn perform this in recent years you'll know that he launches into an improvised singing section that really shows what he can do. I suppose it's a bit like Marmite though, you either love it or hate it. Some parts of the audience were transfixed, mouths open... others lost interest quickly, although they were in the minority. This was the best I have heard Glenn sing this, his vocal range was immense and the power in his voice truly astonishing. 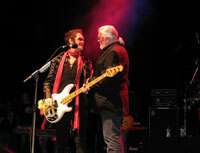 Following this he performed Soul Mover, sharing vocals with Thunder's Danny Bowes. After Glenn left the stage there was a short two song set from Steve Harley before all the performers returned for a run through of Smoke On The Water, led by Jon on the Hammond. Lead vocals were shared between Danny Bowes, Bernie Shaw, Justin Hawkins and Glenn. You could really tell how much more power Glenn has in his voice when he sang with the others, he truly owned the stage and deservedly so. A great evening for a worthy cause." 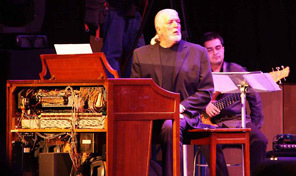 "A wonderfully atmospheric setting for a brilliant and inspiring concert illuminated by Jon Lord the composer, Jon Lord the performer and Jon Lord the man. 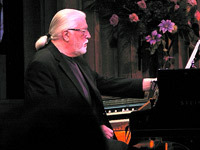 Lichfield Cathedral provided an excellent backdrop for this rare chance to see Jon Lord in action. Jon kicked off with a new piece dedicated to the late John Mortimer, and immediately I was struck by the brilliance of the Badke Quartet, particularly the cello player. More beautifully performed pieces followed including De Profundis with its Deep Purple references and a tremendously atmospheric Miles Away. From The Windmill (a favourite of mine) was particularly beautiful. Steve Balsamo sang Pictured Within with great feeling and although his voice is somewhat higher than Miller Anderson's the result was breathtaking. Kasia Laska showed her enormous range and gave fantastic performances shining brilliantly in Evening Song, Wait A While and the bittersweet The Sun Will Shine Again. 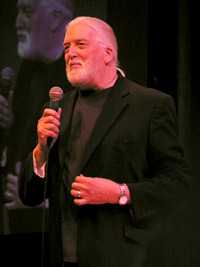 During the morning 'Audience With Jon Lord' at Lichfield Garrick Theatre Jon Lord was asked about the chances of a MkIII reunion (not MkII) and said it had "a snowball's chance in hell".... "Ian Paice already has a job". He also said how well he thought Blackmore was playing now (whether you like it is another matter he said) and they have talked about working together. 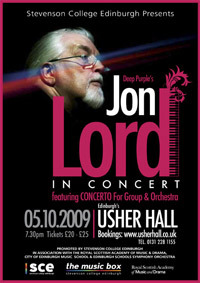 And, there is a possibility of a Jon Lord prom next year. 1st half : Miles Away (without vocal refrain) / De Profundis / Pictures Within / Sarabande / One From The Meadow / From The Windmill / The Teleman Experiment. 2nd half: Evening Song / Bouree / Air On The Blue String / Unsquare Dance / Soldier Of Fortune / Gigue / Wait A While / The Sun Will Shine Again / Child In Time. Pictures Of Home was listed in the programme but not played. "Highlights? All of it! Lowlights? None. The group slipped seamlessly from one piece to another despite the huge contrasts and requirements. Occasionally during the louder tracks the strings got a little drowned out but that is nit picking in the extreme. Kasia Laska in particular gave a stunning performance. The gig really caught fire in the second part with a haunting “Soldier of Fortune” – introduced as “written by my friends Richie Blackmore and David Coverdale, or at least they were my friends” and a humorous dig about arranging it but not getting any royalties! "Despite a lack of publicity from this site (not guilty m'lud, it's been on the Jon Lord news page since June 23rd! ) the Maestro performed to over a thousand souls in the National Concert Hall in Dublin on Thursday night. 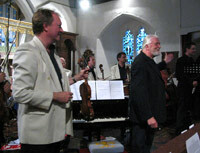 The Concerto was very well received, despite the day also being Arthur's (Guinness) birthday. Jon built up a fantastic rapport with the audience and my wife remarked that he looked like a man at ease with life. After the break we had the eclectic mix of Deep Purple songs and Jon's own compositions with excellent vocals from Steve and Laska. Special praise to the RTE Concert Orchestra who really enjoyed themselves, a fact borne out by the comment overheard by us from the lead violinist " we don't normally get this much applause". It was well deserved. 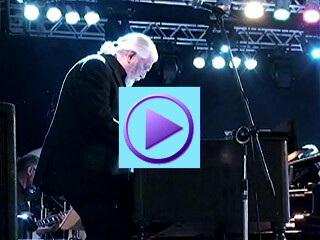 An excellent nights entertainment.."
"I just had to put down some thoughts on yesterday evening's superb performance by Jon Lord and students from Stevenson College, City Of Edinburgh Music School and The Royal Scottish Academy Of Music And Drama. It was an excellent evening with a first-class performance of the Concerto by a group of highly talented students. I'm not of the vintage to have been around in 1969 let alone attend the RAH, but it was obvious that something quite special happened all those years ago which would warrant it still being relevant even forty years later. Last night in Edinburgh was obviously an enjoyable experience for Jon and the musicians - and they performed impeccably. I was particularly impressed by vocalist Grant Barclay who, whilst keeping relatively faithful to Iain Gillan's vocals in the Second Movement, also put his own stamp on the performance. The encore of 'Child In Time' was even more powerful than the a purely rock band version; the power of the orchestra was really felt in the piece. Many complementary words were bestowed on the students from Jon and conductor Paul Mann - both obviously very proud of the fiery performance of all the musicians. Well done all - truly it was the 'full Sir Malcolm Arnold'!" 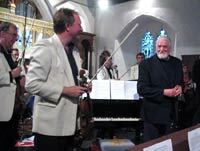 "There were smiles all round, and the standard of the music being played was exceptional. The rock band kicked in and proved they were also of a high standard of musicianship. Joined by Jon on the Hammond, the band got into that wonderfully funky late 60’s rhythm. With two guitarists in the band it was quite interesting to see they way they divided the solos between them. The cadenza was written a few days before the event and was wonderfully thought out, ending with the guitarists harmonizing together joined briefly by Jon, before the whole ensemble finished the movement with a glorious flourish. The rapturous applause seemed to shock some of the orchestra, almost like they had forgotten an audience was even there. Paul Mann just beamed his widest smile at them all and the second movement commenced. How would the 18 year old Grant Barclay cope with the singing. With incredible ease as it turned out. A really wonderful vocal delivery of the 1999 lyrics, he had wanted to use the original 1969 lyrics but was talked out of it. It did not matter, he was excellent..."
"Well, it was a very emotional experience for me, as Tthe Concerto was the reason for me getting into Deep Purple and I consider this 40 year young genre of music the true contemporary art. Also, I am from Roussè and I rarely miss one of our orchestra's concerts. Here I should say that about a half of the musicians are Deep Purple and Jon Lord fans and those who were not now are: everyone I spoke to admired the way that he lead the rehearsal and the whole working process – encouraging and respecting every player in a very relaxed and friendly manner.." Lachezar Dotchev. Hotnews.ro carry a feature on the show, as well as a gallery of photos.